Who is Julia Vogl? Julia is a London-based, internationally acclaimed artist whose work is expertly rooted in fostering community dialogue. 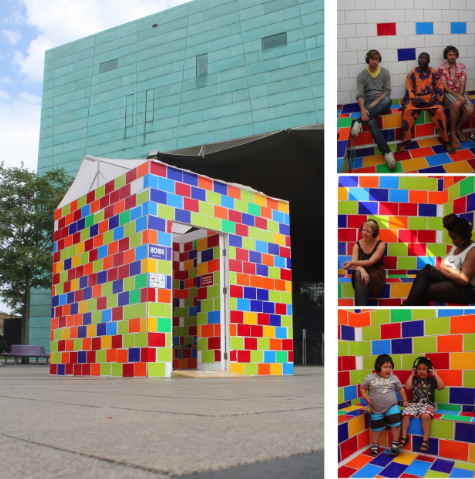 Through the use of important and charged questions, simple colors, and an incredibly clever use of public spaces, Julia creates space for community dialogue through art. She also grew up in a Jewish home in Washington, DC, and is excited to work with JArts on her first Jewish-inspired commission. This blog is the first in a series that will track Julia’s process as she learns about the Boston community and develops a project that will highlight the story of exile and immigration that is an essential part of Boston. This piece, in a to-be-determined Boston location, will be installed for the duration of Passover 2018 – and bring the Passover story of exile and freedom to life in a fresh way. JArts began a conversation with Julia surrounding this project in August 2016. In January 2017, Julia spent two weeks in a Greek absorption center / refugee camp to volunteer and understand the process that refugees encounter. During this visit, Julia created the @RefugeeStory2017 Instagram account, through which she will be visually tracking the evolution of this project. Check it out to see her process. Julia will be in Boston from April 23-29, 2017 to meet with key community stakeholders and to understand what Boston site would best accommodate this project. In addition to meetings with leadership and community partners, Julia will be joining JArts for a Shabbat dinner on Friday, April 28th. Tickets are available here if you would like to join in the conversation. Please reach out to Joey Baron if you would like to play a role in this process.